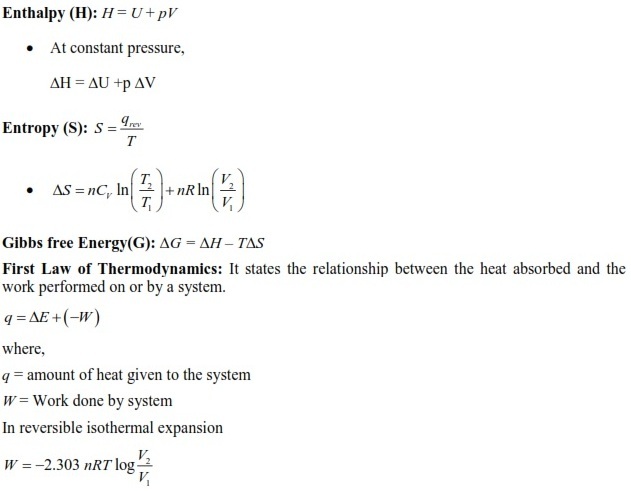 In this article, students will get notes of chapter Thermodynamics including topics important concepts, formulae and previous years’ solved questions for WBJEE 2018. These notes will help engineering aspirants in their preparation. Every aspirant wants admission in the best engineering college by securing good rank in engineering entrance examinations. Aspirants will have to focus on all subjects if they want to secure good rank in the examination. Students should try to prepare notes of all the chapters of all subjects during their preparation for the examination. To help aspirants to score good marks in coming WBJEE 2018, the engineering section bring to you the notes of chapter Thermodynamics. Students always get 1-2 questions from this chapter in the examination. 1. These notes are based on the latest syllabus and pattern of WBJEE entrance examination. 2. These notes are prepared by Subject Experts of Chemistry. 3. Some previous years’ solved questions are also included here which will help aspirants to get familiar with the difficulty level of the questions asked in the previous years’ paper of WBJEE test. System: The part of universe in which observations are made is called system. Surroundings: It includes everything other than the system. State variables / State functions: The functions whose values depend only on the state of the system and not on how it is reached are called state functions. Anything given to system is taken positive. Anything taken out of system is taken negative. Intensive property: This is a property whose value doesn’t depend on the quantity or size of matter present in the system. Extensive property: This is a property whose value depends on the quantity or size of matter present in the system. 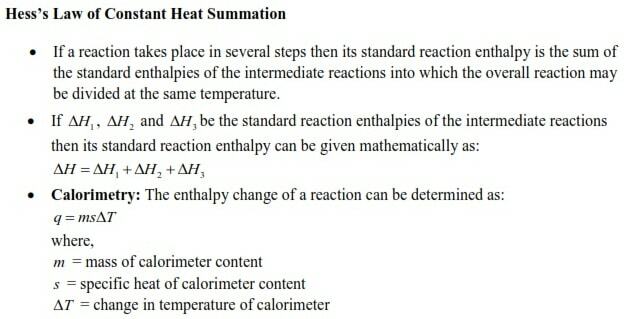 Standard enthalpy of reactions: It is the enthalpy change for a reaction when all the participating substances are in their standard states. Standard Enthalpy of Fusion: It is also called molar enthalpy of fusion and denoted as ΔfusH°. It is defined as enthalpy change that accompanies melting of one mole of a solid substance in standard state. Standard Enthalpy of vaporization: It is also called molar enthalpy of vaporization and denoted as ΔvapH°. It is defined as amount of heat required to vaporize one mole of a liquid at constant temperature and under standard pressure. Standard enthalpy of sublimation: It is denoted as ΔsubH°.It is defined as the change in enthalpy when one mole of a solid substance sublimes at a constant temperature and under standard pressure (1 bar). Standard enthalpy of formation: It is denoted as ΔfH°. It is defined as the standard enthalpy change for the formation of one mole of a compound from its elements in their most stable states of aggregation. It can be positive or negative. Standard enthalpy of combustion: It is denoted as ΔcH°. It is defined as the heat evolved when one mole of substance in standard state is oxidised completely. It is always negative. It is an extensive property. It is a state function. On reversing the chemical reaction the sign ΔH of also reverses. When ΔG<0 then the reaction occur spontaneously. So, for spontaneous reaction ΔH-TΔS should be negative. Which of the following plots represent an exothermic reaction ? Students can also have a look on the following questions and solutions to check their preparation. The criterion for spontaneity of any process the change in entropy is (ΔSsystem + ΔSsurrounding ) > 0. Elements in its standard state have zero enthalpy of formation. Since, Cl2 is gas at room temperature, therefore ΔH° of Cl2(g) is zero. Work is not an example of state function. When the surroundings are always in equilibrium with the system, then the process is called reversible process. Students can easily understand this chapter as the content given here is arranged in a systematic manner. Students can also track their progress by attempting the questions given here. They can also refer the solutions if they stuck somewhere while attempting the paper.